Eighteen months ago, Elizabeth Sibanda used to spend hours fetching water for her family. The well nearest to her home in Nechilibi, Zimbabwe, was several kilometers away. Each round trip to get water took at least an hour, and she had to go 2-3 times a day. Today, Elizabeth’s life is different. For one thing, she has more time in her day. Last year, Maranatha Volunteers International drilled a borehole in her village—just ten minutes from her home. 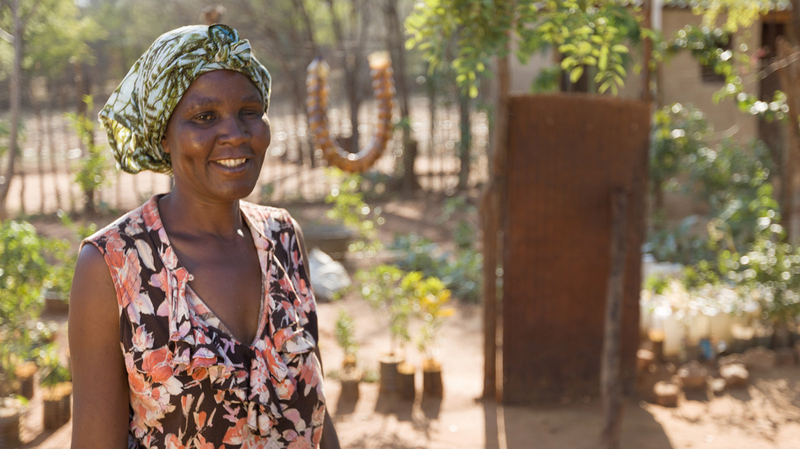 The time savings and access to water has allowed Elizabeth to plant a beautiful garden and fruit trees in her yard, which has provided food for her family. Next to the well, the village has also started a community garden, where people can grow vegetables even through the dry season. Thanks to the generosity of Maranatha supporters, an entire village now has access to clean water and their lives have been transformed. The well in Nechilibi is part of Maranatha’s water well program, and in 2017, our goal is to provide at least 25 boreholes in Zimbabwe. But we cannot do it without your help. As part of this year’s #GivingTuesday movement, an international day of giving to your favorite charitable cause, Maranatha is hoping to raise $10,000 for a water well in Zimbabwe. On November 28, the first Tuesday after Thanksgiving, we’re asking everyone to give to Maranatha for a water well. Through the generosity of many, we want to raise $10,000 in one day! Simply visit our website on November 28, or connect through our Facebook page, to make a donation for #GivingTuesday. Please help us to bring clean water to another village and change the lives of more people like Elizabeth! The #GivingTuesday movement was started in 2012 by the 92nd Street Y and the United Nations Foundation as a response to escalating consumerism following the Thanksgiving holiday. The event, which takes place the first Tuesday after Thanksgiving, is largely promoted online and through social media.